You have a very important Space Mission! to complete. 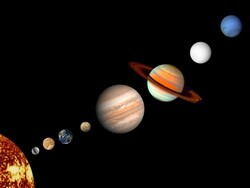 You must find all eight planets, where they are located near the sun and how they compare in size to the Planet Earth. Remember My Very Energetic Mother Just Served Us Nachos. If you can solve this riddle you are almost there! Happy Space Findings, Earthlings!!!! 1. First you will need to identify the eight planets. To do this please visit the website https://kidsastronomy.com/solar-system/. You will need to keep a journal with your notes from this lesson. This journal can be completed in your Inquiry book and will be graded on its organisation and information gathered pertaining to the lesson. 1. What is the sun? 3. What is the moon? 4. Which object is located most closely to the center of the solar system? 5. Who visits outer space? 6. Which planet is furthest from the sun? 6. Last you will be split into small groups by your teacher where you will design a model of the solar system given paint, foam balls, paper, and sticks. In this model you must display where planets are located in relation to the sun and Earth and label it correctly. Each student will be graded individually using a rubric which can be collected from the teacher. At the end of this lesson you will be able to identify the eight planets. You will also be able to establish a correlation between the Earth to the sun as well as the approximate distance to the Sun. You will be able to successfully name the nine planets as well as provide in depth information on at least one other planet besides Earth. Upon completing this lesson please provide what other information you have learned about the solar system and its planets. You have successfully completed your mission and have now become an expert on The Solar System and the Eight Planets!!!!!!!!!!!! !